It’s finally fall! Something about this year has had me extra excited about the season and reminiscent of my childhood growing up in the Pacific Northwest where it was all about savoring the last of the rain-less days, frolicking in piles of burnt orange and red leaves, my dad’s football and golf on in the background of every weekend, the buzz of college students returning to town (living so close to campus in Eugene, Oregon, this was a memorable part of growing up), scheming about Halloween costumes, and of course, the excitement of a new school year. But most of all, it was that feeling of home. I loved those fall nights after school and would look forward to our evenings together as a family. My parents music would be playing as we did homework or crafts and my mom cooked dinner. New smells would waft from the kitchen of roasting veggies, hearty stews, fresh pesto…I have my mom to thank for raising us on home-cooked, healthy, real food. Even as a working mom, she made it a priority…something I’m more and more thankful for the older I get. We always tried “just a bite” to see if we liked new flavors and dishes and because of this, we became appreciators of a wide variety of foods. My mom made us part of the process, letting us help out where we could (even when we made a mess or things came out far from perfect). My sister and I loved to help in the kitchen and one of our favorite things to do was homemade fruit roll-ups! My mom had an awesome 80’s dehydrator (did it have a brown-and-orange-flower pattern on it, or was that our slow cooker?) lol. We would cook apples with lots of spices, put them through a strainer, and then spread all the soft applesauce out onto the dehydrator trays. Waiting hours or over night for our fruit roll-ups was like torture for my impatient little self (but a much-needed lesson in patience now that I look back on it!). When they were ready, we loved peeling them off the trays, carefully cutting, and rolling them to keep for snacks and to put in our school lunch boxes. Now my favorite flavors of the season remain…figs, pomegranates, pears, pumpkins, apples, and everything spiced! Recently my friend gave me a whole bag of beautiful apples from her apple tree and I needed to figure out how to use them. 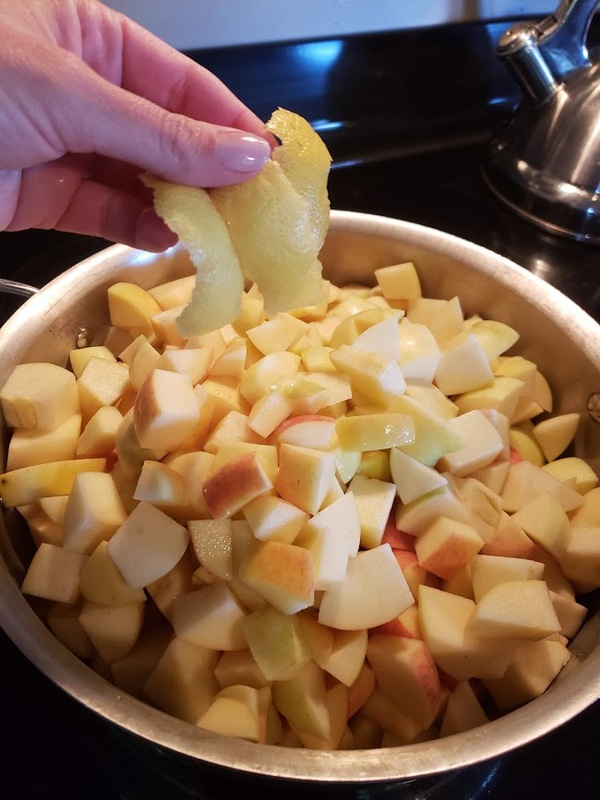 At the same time, in my holistic nutrition class we had been talking about digestion and how the pectin-rich skin of apples and pears is so beneficial for gut health, digestion, skin health, and even cancer prevention. Pectin is a type of soluble fiber that acts as a prebiotic, meaning it feeds the good bacteria in our gut and kick-starts the digestive process. 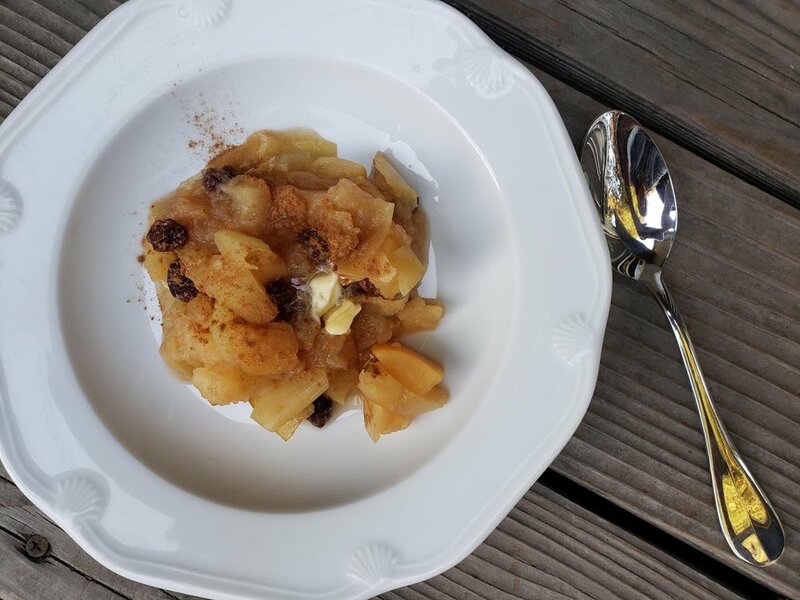 We learned that when you cook apples, it actually boosts the pectin’s effectiveness. I was so excited at the synchronistic timing and couldn’t wait to make make up a new dish. So, I decided to give the apples a rough chop, throw them in a big pot along with ample spices, a spritz of fresh lemon juice and peels. I added in some organic raisins, covered with a snug lid and let it all stew together on the stove. An hour later, the house smelled like a “warm hug” (as my boyfriend described it). I plopped a dollop of butter on top and a sprinkle of sea salt and it was ready to enjoy. 1. Wash apples and lemons. 2. Give apples a rough-chop, removing the core, and adding to your pot over medium-low heat (make sure it’s a pot you have a lid for). 3. Add water lemon juice, lemon rinds, raisins and spices. Cover and let simmer for 20 minutes. 4. Reduce heat to low and give the apples a good stir. Replace cover and cook an additional 30 minutes. If you prefer smoother, you can stir along the way, but if you like chunks of apple like I do, don’t stir again until the end. The apples on the top layer will stay firmer and the ones at the bottom of the pan will be softer and more applesauce-like. Once mixed at the end, it makes the perfect combo! Suggested serving: I love eating this mixture strait after it’s been cooked - heated with a dallop of butter and dash of sea salt. It’s great served over slow-cooked oats or vanilla ice cream. You could also eat it cold, like applesauce or put in your kids lunches! I scooped the rest into mason jars, which seal nicely once you pop them in the fridge, and have been enjoying almost daily for breakfast or a snack. I made it again last week and added a couple pears to the mix - super yummy! I hope you enjoy this dish as much as I do and feel peace of mind knowing that everything in it is nourishing for your body - soluble fiber and quercetin-rich apples, vitamin C-rich lemons, raisins, which are wonderful sources of iron, potassium and antioxidants, and cinnamon with its anti-inflammatory, anti-diabetic, and immune-boosting effects. Combined, this dish is a wonderful remedy for keeping your cholesterol in check and preventing heart disease, healing leaky gut, increasing your intake of anti-inflammatory, antioxidant-rich foods and even preventing cancer. Somehow making this dish brought me right back to the cool, crisp autumn evenings of my youth, along with the comfort of routine and family. There’s nothing quite like the smells and sounds and flavors of this season. 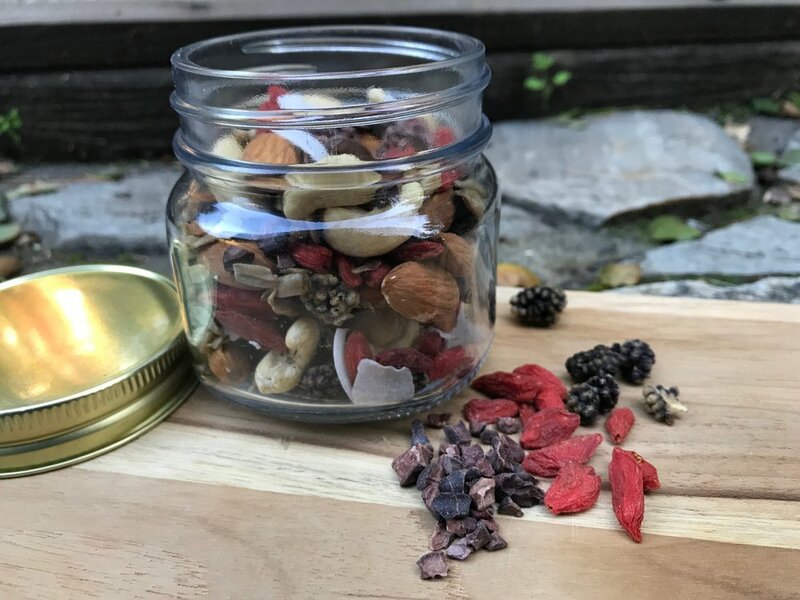 I think we have all found ourselves buying trail mix when we're in a pinch for a "healthy" bite. It is high-density nutrition, packed with protein and all the things our bodies crave when we're running low on energy - salt, sugar, and fat. And while, trail mix can be the lesser of evils when trying to find a decently healthy snack when you're in a pinch, I think we can do better! 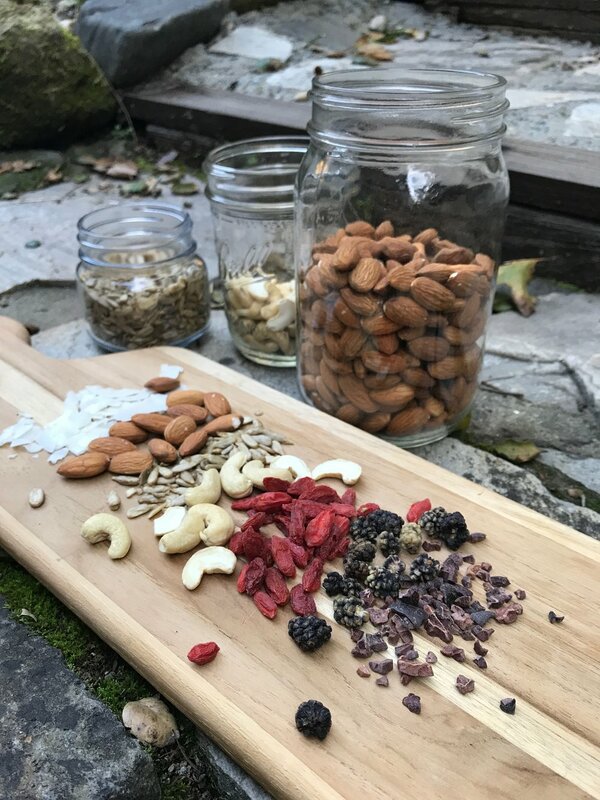 By making our own trail mix, we can get the same satisfaction we find from the packaged varieties, but with a whole lot more control over what's going into our bodies. We can also add super food ingredients! And if you're already buying the expensive, organic and quality trail mixes, that's awesome. But consider making your own - it can be less expensive and more fun! Plus you can switch up the ingredients from day-to-day, adding some variety. This would also be a super easy and fun kitchen activity for the kids in your life! SIDE NOTE ABOUT SOAKING YOUR NUTS! Soaking and drying nuts before consuming them is an added bonus. Here's why - seeds and nuts are the pods from which life spawns (just like an egg is in the animal world). They hold everything a new plant needs to begin life - just add soil, water, and sun, and voila! But mother nature has a way of protecting things that are vital to life. And, in this case, we call that protection phytates. Phytates (and phytic acid) are antioxidant compounds found in whole grains, legumes, nuts and seeds. While phytates are a phytonutrient and an anti-oxidant and protect against free-radical damage and cell overgrowth (cancers), they can also bind to certain minerals and prevent or slow their absorption. This means, if you have a diet high in nuts, seeds, and whole grains (and/or if you have a sensitive digestive system), you should consider soaking most of the time to make sure you are properly absorbing all those amazing minerals your consuming. But it also means - don't be paranoid if you don't have time to soak every time! This is the same reason why soaking beans before cooking makes people less gassy, and why sourdough bread is easier to digest than non-sourdough. In both cases, the digestion process begins before we consume it - activating nutrients and neutralizing enzyme inhibitors. Here is a great resource about soaking your legumes. The recipe for my go-to mix is below, but feel free to play around and choose your favorite flavors. The main thing is to get real, unsweetened, unsalted ingredients. If you have time to do a little prep before a busy week - lay out some jars and make yourself a bunch at a time - combining a slightly different "mix" for every day of the week, if you like. They make a great snack to grab on your way out the door in the mornings. Combine ingredients together in a jar and shake to mix! This mix is gluten-free, dairy free, added sugar and added salt-free, vegan. 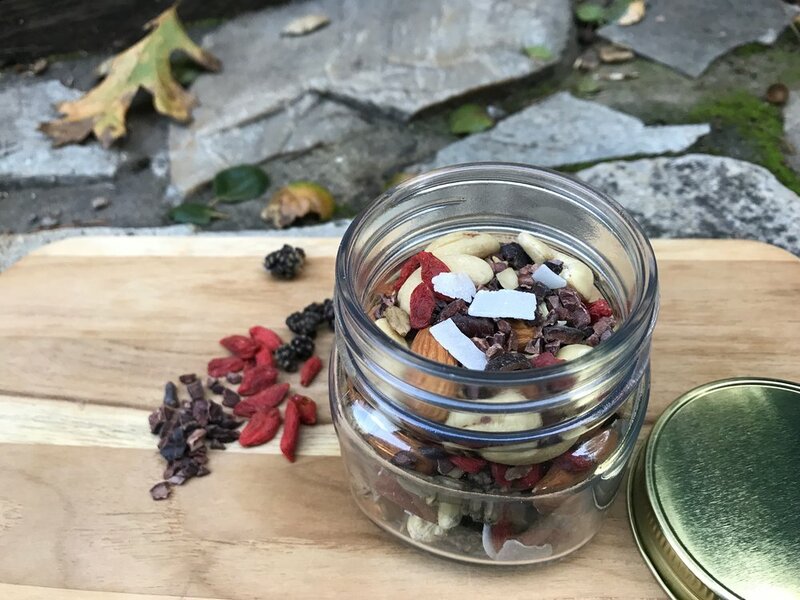 Cacao nibs, which contain a small amount of caffeine, are a high in anti-oxidants, meaning they absorb free-radicals in our bodies before they damage our cells. Cacao nibs are also a great source of fiber, iron, calcium, and magnesium. The nuts and seeds in this recipe contain healthy fats, oils, and fiber (great for gut health!). Almonds are a good source of antioxidant flavonoids and have been shown to lower cholesterol and fight against heart disease and many cancers. Goji berries have the antioxidant beta-carotene, which has been shown to improve skin and eye health. Traditionally, they have been used to improve mood and ease depression and anxiety, and even boost fertility! Mulberries contain resveratrol, a polyphenol flavonoid antioxidant, that is linked to heart health. It has also been shown to increase the activity of mitochondria, producing energy within the cells and potentially extending their life (this could translate into anti-aging benefits!). Most of these ingredients can be found in or near the bulk section of your local health food store. I like to compare the bulk vs. pre-packaged options for price and quality. I hope you have fun making your own trail mix. I would love to hear what delicious concoctions you come up with - please share in the comments section! 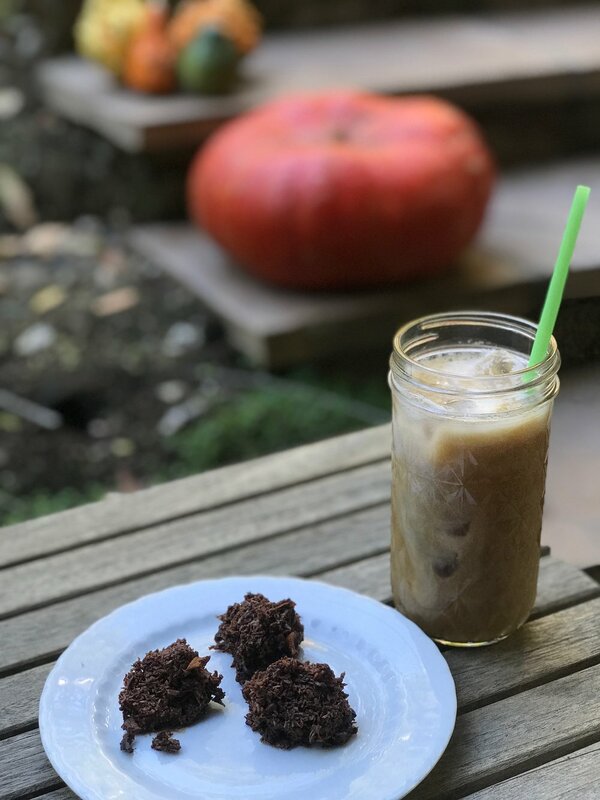 Coconut Cacao Bites with coconut cream iced coffee - the best afternoon treat. Okay, I'll admit it, I have a sweet tooth. And I love chocolate. Who's with me?! But my ever-increasing pickiness for...no-sugar-added, no fake/corn/soy ingredients, no dairy, gluten, or binders....and the rest of the long laundry list that has me spending more time than I care to admit at the grocery store staring at the rear side of every package, recently gave me an epiphany. As I stared at a particular "natural" package of chocolatey bites ($5 for about as many bites, I might add), I realized I could just as easily "put this thing right back where I found it and make these myself, gosh darn it!" So I decided to do just that, and, I realized, I already had plenty of things in my pantry I could use to whip this up, with the exception of the cacao powder. 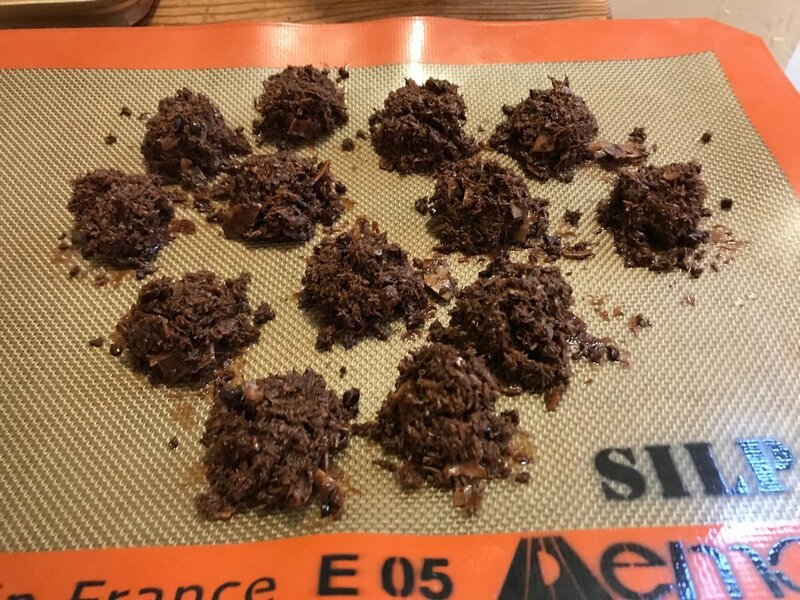 So with the cacao powder in-hand, I came home and concocted the most delicious and decadent little bites I ever did have. They fit my laundry list of requirements, and I have to say, making them myself was super fun. I don't consider myself a good baker, so the good news is - you don't need to be a baker for these to turn out delicious. Besides, they're not baked - they're actually frozen! Side note: these would also be fun to make with the chocolate-loving kids in your life, as they are simple, yummy, and fun to put together (and, of course, have some superfood health benefits to boot)! Heat coconut oil and butter over medium-low heat until just melted. Remove from heat. Add in cacao powder, stirring until dissolved. Add in the following ingredients (maple syrup, molasses, vanilla, cinnamon, salt), stirring well to make sure everything is incorporated. Next, fold in shredded coconut, coconut chips, and cacao nibs. Form into ~1-inch balls and place onto parchment paper or Silpat. They may seem crumbly, but they will set in the freezer. And, finally, place in the freezer to set for an hour. After the bites have set, transfer them to a container or bag and store in the fridge. They will keep for weeks (if they last that long) in an air-tight container. Ready to go into the freezer! Cacao nibs and powder are natural and minimally-processed forms of what most of the world thinks of as chocolate. The cacao plant (also called cocoa) is grown for its edible seeds and its scientific name (Malvaceae, formerly Sterculiaceae) means "food of the gods" in Greek. (1) Cacao is rich in healthy saturated fats, but the kind that doesn't elevate cholesterol (like meat and dairy products do). Cacao is a rich source of flavonoid antioxidants, which protect the arteries (working like a low-dose aspirin), preventing blood platelets from clumping and thereby preventing blood clots. Cacao is also rich in arginine, an amino acid that helps with blood flow, inflammation, and blood pressure. And if all that wasn't enough, the neurotransmitter called anandamide, which works to trigger the same brain cell receptors as marijuana's THC, causes us to feel more relaxed and euphoric, and less anxious. Blackstrap Molasses, unlike most other sweeteners, is minimally-processed and, because of this, retains a number of trace minerals. It is an excellent source of iron, B6, calcium, copper, manganese, potassium, and magnesium. Coconut Oil has, at different points in history, gotten a bad rap. But the truth is, coconuts contain health-promoting medium-chain saturated fats, which increase levels of beneficial HDL (high-density lipoprotein) cholesterol. The only other abundant form of medium-chain saturated fat called lauric acid, is in human breast milk! In the body lauric acid converts to a super badass compound called monolaurin, which has antiviral, antibacterial monoglyceride. These natural antimicrobial properties have the ability to destroy many disease-causing organisms, and potentially-harmful fungus, yeasts (Candida), and even ringworm. Coconuts are also rich in manganese, molybdenum, copper, selenium, and zinc. Coconut oil also protects against heart disease and promotes weight loss, by increasing the body's metabolic rate. Suggested pairings - iced coffee and a good book - the perfect afternoon jolt of energy that will have you ready to tackle the rest of your day! I hope you enjoy these little morsels as much as I did! Come to think of it, I may need to make another batch.